The investigation into a wave of homemade pipe bombs addressed to political enemies of President Trump expanded Thursday with the discovery of more suspicious packages in New York and Delaware. The tally found nationwide increased to 10. The FBI said two suspicious packages were discovered in Delaware on Thursday morning addressed to former Vice President Joe Biden, while a third was found in New York City addressed to the actor Robert De Niro. The new items were “similar in appearance” to seven packages already discovered this week that had been sent to six other high-profile critics of President Trump, including former President Barack Obama and former Secretary of State Hillary Clinton, the FBI said. The packages, which have contained potential explosive devices described by officials as pipe bombs, have sent jitters across the country and prompted calls from Republicans and Democrats for a cooling of political rhetoric. In Delaware, officials were alerted early Thursday morning to a suspicious package addressed to Biden and discovered at a mail facility in New Castle County, a law enforcement official said. A second suspicious envelope was found a few hours later at another mail facility in Wilmington, Del., according to the official, who spoke on condition of anonymity. In New York, meanwhile, police said a suspicious package was discovered in the Tribeca area of Manhattan in the early hours of Thursday morning. That package contained a device similar to one recovered from the offices of CNN on Wednesday. The New York City Police Department says the package was reported around 4 a.m. in the area of Greenwich and Franklin streets in Tribeca. 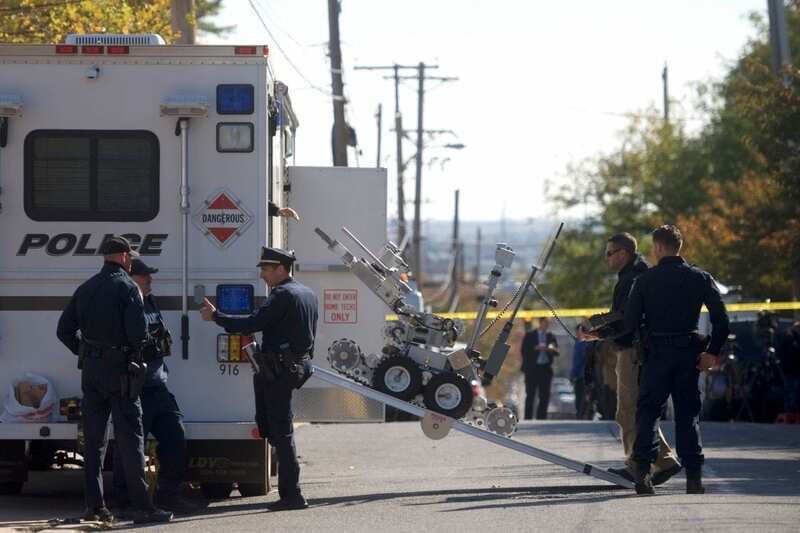 The police bomb squad responded, and it was “removed from the location,” the NYPD says. Others were addressed to former CIA Director John Brennan in care of CNN in New York; one to former Attorney General Eric Holder and two to Rep. Maxine Waters, D-Calif. The first package was reported on Monday at a residence of billionaire investor George Soros, who is an active supporter of Democratic causes. The package addressed to Holder did not reach him at his law firm in Washington D.C.; instead it was rerouted to the return address affixed on the envelope — that of Florida Rep. Debbie Wasserman Schultz. Specifically, he said, the X-ray shows only one set of batteries for the timer. That isn’t enough. Trump was briefed on the investigation Wednesday at the White House. He said the inquiry into the packages will have whatever resources are needed, and FBI Director Christopher Wray has pledged that the bureau will not rest until the culprits are caught. The suspicious devices are on their way to the FBI’s crime lab in Quantico, Va.